According to physics education researchers, Chandra Turpen and Noah Finkelstein 2010, Peer Instruction implementation “varies widely”. One of these variants involves the process for administering ConcepTests. 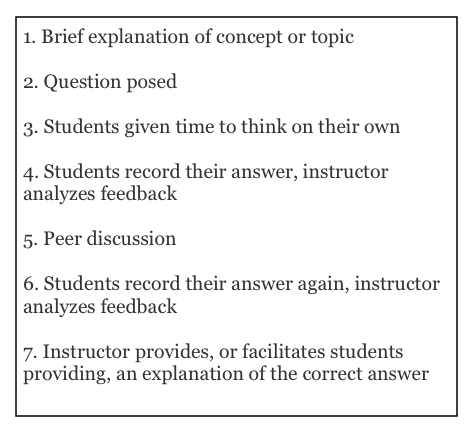 Turpen and Finkelstein report that most instructors at UC-Colorado, where Peer Instruction is widely used in science classrooms, do not ask students to commit to an answer individually before engaging in peer discussion. Is it necessary to ask students to commit to ConcepTests or clicker questions on their own first? We posed this question to Turn to Your Neighbor readers last week, with the results below. Most people said yes, the first individual vote, is an important step. While it ultimately depends on the purpose of the ConcepTest or clicker question, we agree with our readers, especially if you are hoping to achieve in your classroom the statistically significant learning gains we have observed in our research (see Crouch and Mazur 2001 and Fagan, Crouch, and Mazur 2002). Our recommended, best-practices approach is outlined in the workflow presented in Figure 2. As in all flipped classroom environments, this in-class workflow is preceded by out-of-class activities and warm-up exercises, such as online reading assignments. Why ask students to vote, on their own, first? From a learning sciences perspective, requiring students to vote first allows them to engage in some important activities we know to be linked to learning: 1) metacognition, or thinking about their own thinking or reflecting on their awareness of what they know and what they don’t know and 2) retrieval practice, the process of retrieving information in our memory for current use. Recent cognitive science research by Karpicke and Blunt 2011 suggests retrieval practice may improve longer term knowledge retention. By the time you discuss it you all have your own opinions so you are less likely to just agree with other people. You can see where you have gone wrong in your original answer and learn from it. It can help you identify misconceptions if you think individually first. It gives you different opinions rather than one group member knowing the answer and telling you. It makes you reason your point of view before explaining it to others. As Dr. Alvarado suggests, facilitating an individual vote first, before asking students to turn to their neighbor, gives instructors critical information about how to proceed in their teaching. Peer discussion may not always be the most appropriate instructional decision and without a first vote, we have limited awareness of what students’ conceptual understanding is before peer discussion, or how much that peer discussion improved their understanding, if at all. “Polling students first helps me accomplish several goals: the quiet reflection sets the stage for contemplative thinking that is so critical when discussing theory; it confirms what students understand for me and them; it reinforces for students the concept that they need to be able to defend their ideas with evidence; and it gives me an idea of what to listen for when I walk around during discussion. Students can no longer hide their misconceptions by simply participating in discussion or agreeing with classmates – they are forced to really wrestle with their own understanding of the material,” said Alvarado. Turn to Your Neighbor Turns 30,000 and Launches #flippetip Series – Turn to Your Neighbor: The Official Peer Instruction Blog linked to this post. Still, this is quite suggestive that there may not be an effect of committing to an answer in advance. Interestingly, some of her other conclusions are quite similar to that of Smith et al. in Science, such as co-construction of the correct answer even if nobody in the original group had the right answer. I agree with Steve Pollock; this is what I typically advocate, is to look at the results and decide whether to show the histogram based on those results. If students see the majority answering a certain way, then showing the histogram might shut down student thinking about the answer (they think they know what the answer is). If the vote is split, then the histogram can generate a lot of useful discussion. There is actually a research study that addressed this very question. Does Displaying the Class Results Affect Student Discussion during Peer Instruction? The use of personal response systems, or clickers, is increasingly common in college classrooms. Although clickers can increase student engagement and discussion, their benefits also can be overstated. A common practice is to ask the class a question, display the responses, allow the students to discuss the question, and then collect the responses a second time. In an introductory biology course, we asked whether showing students the class responses to a question biased their second response. Some sections of the course displayed a bar graph of the student responses and others served as a control group in which discussion occurred without seeing the most common answer chosen by the class. If students saw the bar graph, they were 30% more likely to switch from a less common to the most common response. This trend was more pronounced in true/false questions (38%) than multiple-choice questions (28%). These results suggest that observing the most common response can bias a student’s second vote on a question and may be misinterpreted as an increase in performance due to student discussion alone. Thanks for this article. It is very useful. I teach Economics at Universidad Adolfo Ibáñez, in Chile. This semester is the first time I am using clickers and ConcepTests almost every class (undergraduate this time). I agree that giving the students the opportunity to think first on their own maximizes the possible feedback that they can receive from peer instruction. It takes time, but I think that it is worth it in terms of the learning. I have found that showing them the results of this first vote has at least two advantages: (1) they can see that there is dispersion; not everyone is right or wrong and this encourages them to keep trying to understand; (2) it gives me easy feedback on how are the students doing, so that I can adjutst the pace at which to continue with this or the following topic. However, not every time I ask for a vote is for a ConcepTest. I also use quick questions to ensure that they get the main point of a video, o a statement, for review at the beginning of the class, or to open a dialog in terms of voting possible points of view. For these kinds of votes, I only ask once. I will be happy to learn more about your opinions and experiences. If the majority answer is, in fact, the right answer, showing the results may give a “easy evidence” for the “right answer” and the scientific thinking process of arriving to the answer and students perceiving, through discussion with peers, the contradictions of their misconceptions and the logic and coherence of scientific reasoning, may be compromised by this evidence. The majority answer knowledge could inhibit some students to defend their own points of views with their own evidences and knowledge, making then accept, without wrestling, the opinion of the group member that knows it. On the other hand, the student who knows the answer, may use the “easy evidence” to reason the “right answer” without much discussion. The knowledge of the majority answer may also induce the students with no scientific knowledge to instantaneously come up with a particular thinking mechanism to arrive to the “right answer” that is not necessary a scientific mechanism (based on laws and concepts), making them abandon the defence of their one original ideas. In this process, students misconceptions will not be tested and new ones may be created. How many times don´t we ear students defend an already known right answer with wrong arguments? Also, the majority answer knowledge (may it be the write or wrong answer), may shift the major important focus of group discussing, with individual members defending their points of views with their own evidences and knowledge, to just agreeing the “right answer” or accepting the group member that knows the “right answer”. The shift of importance from the process of reasoning to obtain the answer to the answer, per Si, foments automatic mechanisms to obtain results, not scientific reasoning. The “question from a user” poll (should we show the results of the vote before discussion?) may lead to a facile “no” response – but I would argue the correct answer is, as is almost always the case regarding any educational practice, “it depends” (which was not included as an answer!) For instance, there are (admittedly only occasional) times when the histogram can *stimulate* conversation in very productive ways (e.g. when it’s an impressively close tie, or broad split). I am starting peer instruction linguistics classes in Uberaba, Brazil at Federal University of Triangulo Mineiro. I think peer and study in pairs solving questions and problem is an original and fantastic dialogic activity, dialogism like said Bakhtin.